Ishi, the newest synthetic slow-burner from LA-based M. Geddes Gengras, is based on the story of “the last wild Indian” named Ishi, who emerged from the wilds of Northern California in 1911, at the age of 49. M. Geddes Gengras may be best known for two acclaimed collaborations with Sun Araw, but he’s quite accomplished in his own right. He’s played in some of the noise underground’s most famous exports, such as LA Vampires, Pocahaunted, and Robedoor, as well as releasing a slew of solo records, mostly revolving around synthesizers and improvisation. 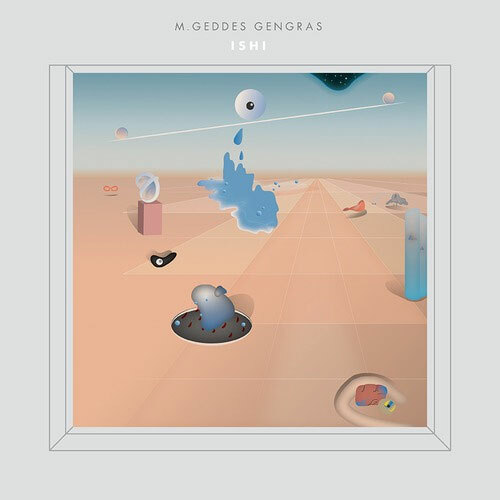 On Ishi, Gengras’ modular synths simulate the sensation of wandering through a city crowd for the first time, where the ladies’ fashion is like so many colorful birds; where the endless stream of faces becomes a babbling brook. It’s almost too much to take in; it’s overwhelming, so it just becomes a colorful blur of humanity. The roots of Ishi, however, do not lie in some far off exotica of noble savagery, but in something far more personal. Music for passage. Between one realm and the next. The cover art for Ishi, done in the same flat, disassociative 2D surrealist style as favored by Oneohtrix Point Never and other electronic theoreticians exploring the field of Vaporwave, offers a possible clue to the prayer of Ishi. While the cover of Ishi may be flat and plastic, the music contained inside is not. The secret lies in M. Geddes Gengras’ “meticulously cultivated machines”. Modular synths involve intricately wiring tone generators to a variety of filters. It involves a level of knowledge and control that a lot of software programmers never realize. It’s the equivalent of the 1,000 monkeys, taking 1,000 years to accidentally stumble upon a Shakespeare play, and the Bard himself. Gengras knows what he’s doing. Ishi‘s press release boasts “a keen ear for timbral manipulation”, while Pitchfork’s Miles Raymer mentions “sustained low end and deft arrangements that are complicated but not cluttered.” It’s true; every sound on this record seems meticulously placed in the stereo spectrum, lapping and lulling like eddying waves, about your consciousness. So many records that focus on ambient “drift” are chilly, glacially arctic. Ambient music is wonderful at evoking emptiness, distance, and longing. But Gengras’ work is warm and full. It makes you feel like lying in a puddle of sunshine, with the light beating against your closed eyelids. It plays over you like a breeze through a slitted window, as distant melodies dance like dust motes. Ishi is a prayer for peace for all of us, hacking our way through the attrition of cyberspace. It is a cone of serenity, amidst the howling hordes, clamoring for our attention. We are wandering through the desert of attention span, while symbols arise, random and without meaning. Ishi provides depth; it shows us wandering into the desert, perhaps ordering the landscape, and eventually finding a home there.